Pizza is probably my number one favorite food. I’m never not in the mood for pizza. Any kind of pizza, simple or gourmet, thin or thick crust, I will eat it! I guess I’m just a sucker for any food item that includes cheese and bread. I’ve scoped out some of my favorite pizza spots in downtown Boulder to review for all of you to try. One of my favorites that always offers up a variety of unique pies is Pizzeria Locale. The pizza I love to get there is the “Diavola” (pictured above). This pizza is topped with salame piccante, smoked mozzarella, pecorino, basil, chili, and san marzano. I love spicy foods so this pizza is like a dream come true for me. Another one of their pizzas I’ve had is the “Maiale”, this one comes covered in prosciutto crudo, mozzarella, parmigiano-reggiano, arugula, and san marzano tomato. The “Maiale” is a safer option for those who don’t want something as spicy as the “Diavola”. 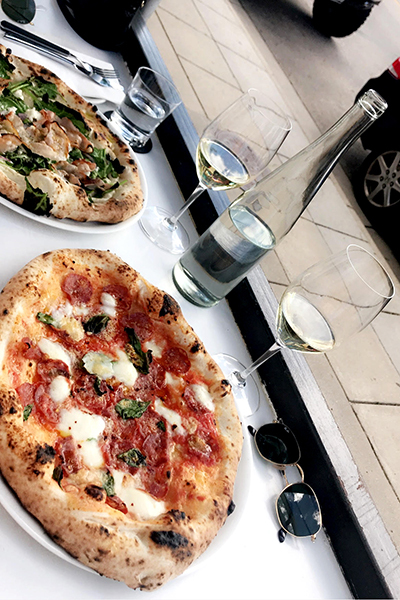 The truth is you really can’t go wrong with any of their pizzas, especially paired with one of their hand selected wines. If you’re looking for a pizza spot that you can just pop in and out of then Pizza Colóre is the perfect option for you! They offer a ton of pizza by the slice to choose from and they pop it in the oven right before they serve it to you. Usually at Pizza Colore I keep it traditional with a slice of pepperoni, but I’ve always been tempted by all their options. One that always catches my eye every time I go in is their “Angry Hawaiian” which looks and sounds like a spicy one. The slice comes with bacon, canadian bacon, angry pineapple, cheddar, mozzarella, and angry sauce. Another great grab-and-go spot is Nick-N-Willy's Pizza. They offer up a nice take and bake option if you’re looking to grab a pizza to throw in your oven later on. I recommend trying their “International”, this pizza is covered in zesty sauce with pepperoni, mushrooms, fontina, swiss, gorgonzola, chopped jalapenos, and cilantro. It’s got a little bit of everything including a punch of flavor. They still have an endless menu with options for every type of pizza eater, and even a build-your-own section! Next time you’re out on a pizza quest head downtown and try the “International”, or see what makes up an “Angry Hawaiian”. Wherever you grab a pie…you can’t go wrong and won’t be disappointed!